The modeled portion of the A&O runs from the imaginary industrial city of Millport on the Ohio River (upriver from Huntington), south through the western lobe of West Virginia and into coal country. The O Scale Appalachian and Ohio is my attempt at "prototype free-lancing" a railroad in the tradition of the Chesapeake and Ohio or the Clinchfield. Set in the verdant hills and valleys of West Virginia, the A&O seeks by design to capture a railfan's by-the-track perspective. The imagined railroad runs from Columbus and Cincinnati to the north and west, to Marion, North Carolina in the south. There is interchange with other railroads at each end and with other actual railroads along the way. The time is summer, 1969. The remainder of the railroad is represented by a connected staging yard that allows for continuous running. This Coal Ridge Subdivision of the Virginian Division includes three branch lines, substantial bridge traffic, industrial and online switching, and coal, coal, coal. Free-lancing a prototype has allowed me to define the railroad according to my personal interests all the while being guided by what the prototype does. I get to choose the color schemes and equipment roster, yet each decision was made after careful consideration of what a full-size Appalachian and Ohio would be like based on prototype practices. Further, by selecting a geographic region but establishing fictitious cities and towns I was able to avoid having to exactly duplicate a location, yet honor railroad friends through town name selection. Choosing 1969 allowed me operate first and second generation diesels as well as lots of 40’ equipment, including old, but character-laden iced refrigerator cars. The Appalachian and Ohio Railroad fills my 1500 sqare foot basement. Careful placement of the furnace, water heater, and basement stairway allowed for entry into the middle of the basement and full usage of the space available. 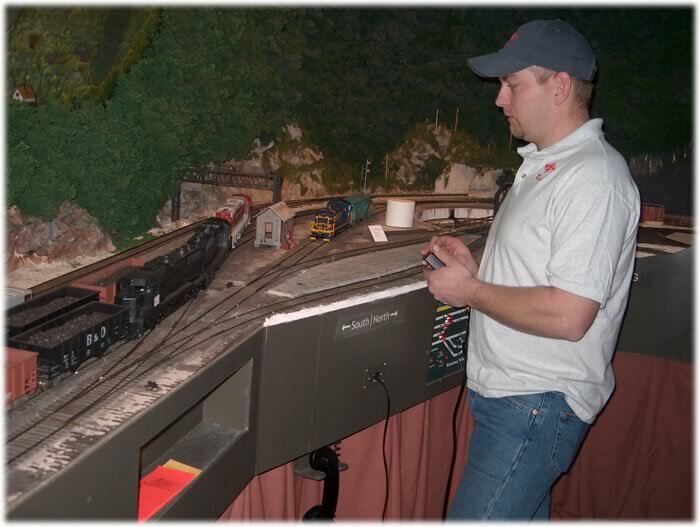 After working in HO scale for 27 years I changed to O Scale, wanting to develop a visual and sensory experience for the model operator. O Scale’s massive size (eight times the volume of HO) seemed a realistic choice for this endeavor. 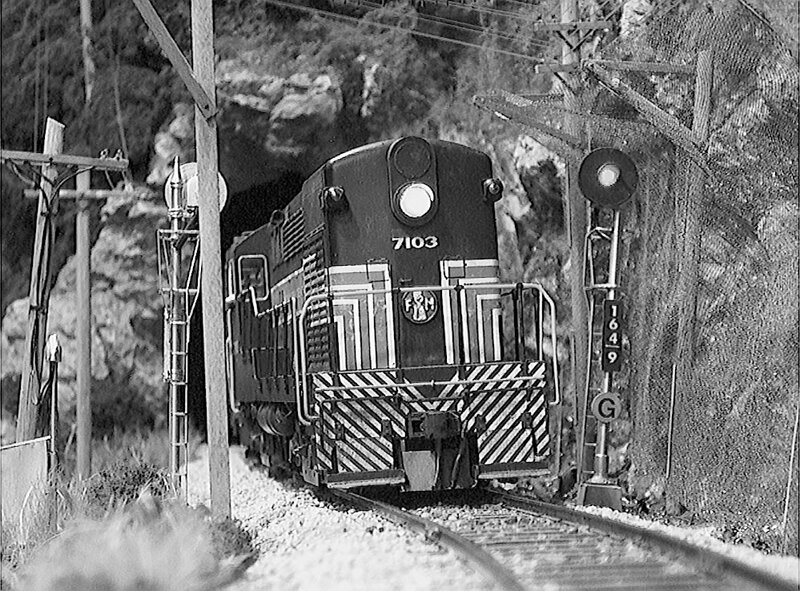 To take advantage of O Scale’s inherent qualities, that of size and easily seen detail, the railroad is designed as a series of vignettes connected by rail. Each area is developed with the viewer/operator in mind, drawing the person into the scene for a trackside experience. 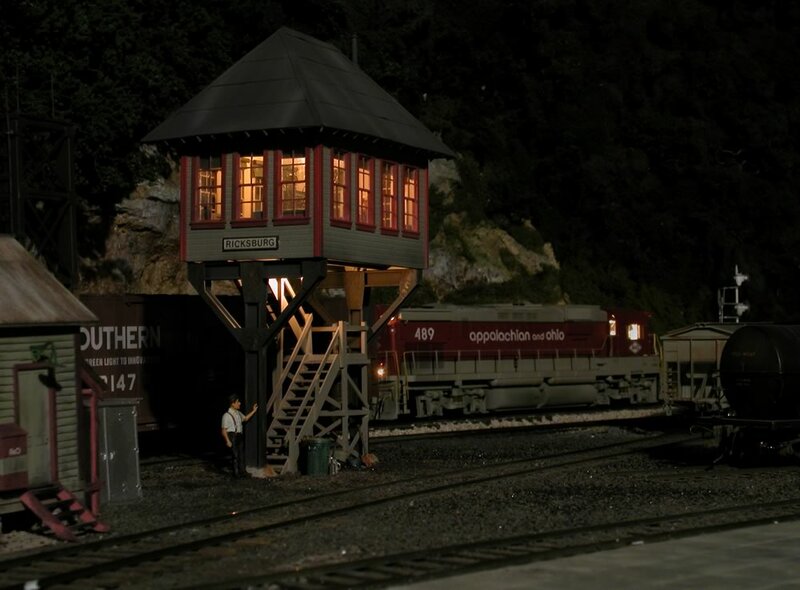 The size of O Scale is utilized to create this feel by having the tree-covered mountains extend beyond the ceiling and the structures of the industrial city of Millport reach above eye level. The trains, and the operator, are dwarfed into the valley or the brick canyons. 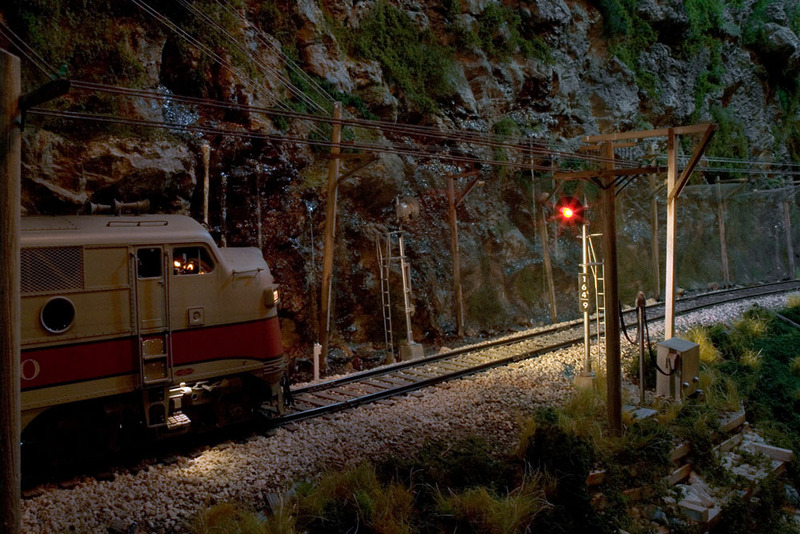 In a couple of places the operator actually steps into the scene, being surrounded by the railroad on three sides as the equipment roars past, struggling up grade. To keep the mountains and the large structures from competing, the city area is entirely separate from rural. The use of view-blocking backdrops to enable a “scenically pure”, walk-around, linear design where trains pass through a scene only once. North is always to the viewer’s right. A feeling of progression, as if moving from one geographical location to another, more distant one. Thus Millport and Willow Creek, the most distant towns, are separated both visually and by walking distance. Adequate aisle space, especially in operationally intense areas was a priority. A staging yard for the unmodeled portions of the railroad. Minimal straight track. Even my yards have gradual curvatures. The Ricksburg yard man is working long hours finishing up paper work on a sultry summer evening. A&O RS3 #137 leads Walden Turn out of Post Tunnel and into the gorge late on a rainy afternoon toward Bayfield. It's a hot summer day and the door is open as coal extra 8WM waits for clearance from the Ricksburg tower in its journey Northward. The Kayford Coal Branch B-unit sees little rest from moving hoppers from tipple to tipple. Slide fencing has prevented many a derailment in the Big Coal River gorge. Ricksburg's turn table stands empty awaiting the next locomotive. Joel Stewart busy at work on the Fillmore Heights switch job. NYC H-20-44 #7103 exits Post Tunnel Northbound with the Penn-Central Transfer. A&O F3 #221 and RS3 #137 exit Post Tunnel and round the bend at Joel Beach. Freight cars bask in the afternoon sun at the north end of Ricksburg Yard. Only a month in service, A&O cab $237 follows obediently behind yet another coal drag. RS3 #137 rolls by milepost 234 and a relaxing section crew. A&O #137 enters Speedy Tunnel having climbed the Morrison grade leaving the Willow Creek valley in the distance. 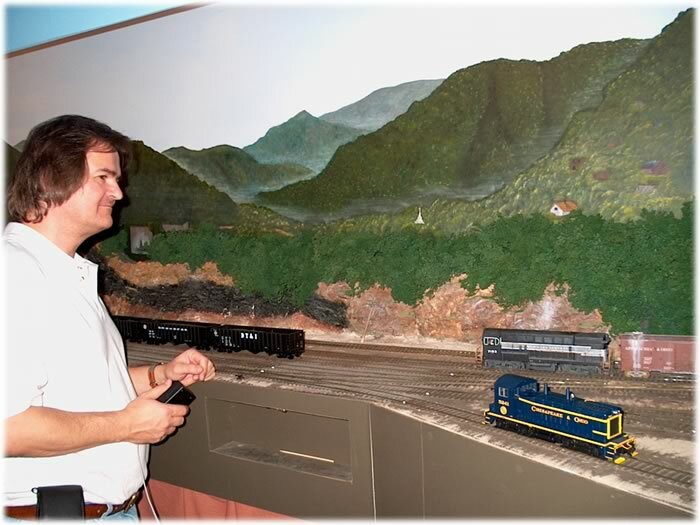 Bob Sobol's beautifully detailed P&D Hobbies F3 #218 exits Speedy Tunnel at milepost 234. With cutting torch nearby, A&O employees contemplate how to retrieve a lost item. It's a light load for the Big Creek Coal Job as it exits the gorge for Bay Tunnel. Late evening sun paints the side of GP35 #400 at milepost 164.9. Even though restoration is still under way, there is no better way to spend a hot summer afternoon than enjoying the cool water at Joel Beach in the River Bend Recreation area. A trio of F3s leads a coal extra through the river gorge. 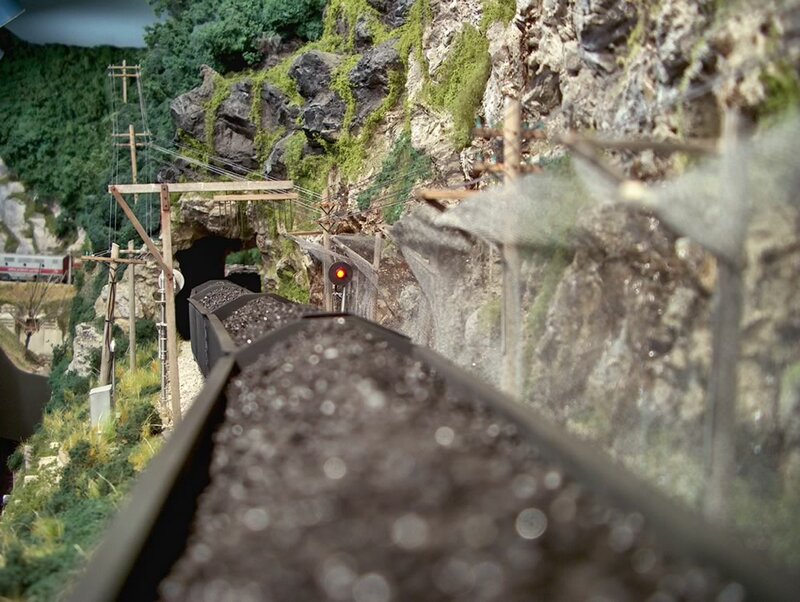 It's a full moon as another coal extra holds at a red signal in the river gorge. The dispatcher coordinates all these movements, currently by track warrant, but eventually by CTC. Car forwarding is done by my personal version of the classic Doug Smith car card system. As a member of the NMRA’s Operations Special Interest Group the A&O has been host to RockyOp, a Colorado operations weekend held each September. Being up close and personal is the main theme of operation on the A&O as CEO, David Stewart, watches first class freight #188 pull the Morrison grade at milepost 234. An A&O brakeman cuts loose yet another coal drag in Willow Creek coal marshalling yard under the watchful eye of the N&W transfer from Bluefield. The C&O Connector exits Tunnel Six at Ridge as Bob's photography grabs another picture. Deep in the Willow Creek valley David Stewart calls the dispatcher before leaving the yard. 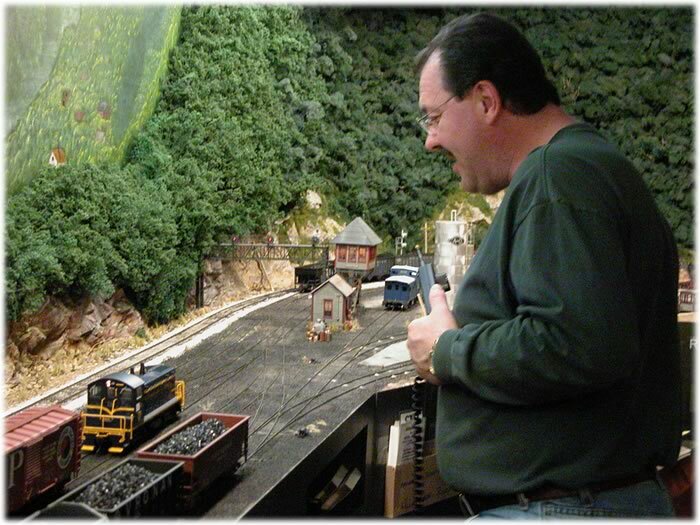 Crew member Dave Zamzow operates the rotary switcher and dump of the Hatfield Coal and Aggregate Coal Company. The Kayford Coal Branch provides the majority of coal loadings on this portion of the Appalachian and Ohio Railroad. The huge King Coal Company preparation plant occupies trackage at the end of the branch. Featuring true conveyor belt operation and two Pittman 12-volt motors, the King Coal Company regularly dispenses up to eight gallons of "coal" in a five hour operating session. ABS plastic pellets provide coal loads for transport. After movement from Willow Creek to Millport, the hoppers are rotaried on a scratch-built model of a Whiting Rotaside Rotary Dump simulating barge loading on the Ohio River. A gravity yard recieves empty hoppers in preparation for the return trip Southbound. The King Coal Company features over 40 lights and stretches more than six feet in length. It is built from styrene and corrugated siding is embossed aluminum foil. Obviously the King Coal COmpany is still working on its safety record. Slac coal is weighed and hauled away in company trucks. Coal is being dispensed from track one from the controls in the suspended operator house on the conveyor support A-frame. This structure was built of brass shapes and styrene. The King Coal Company operates three shifts leaving the Kayford B-Unit #1 little time for rest. GP30 #410 is added to the rear of a coal extra as it exits the Willow Creek yard. #410 is in Run 8 as it pushes on the rear past milepost 234. Helper 410 will cut off here at South Ridge and wait for dispatcher clearance back to Willow Creek. 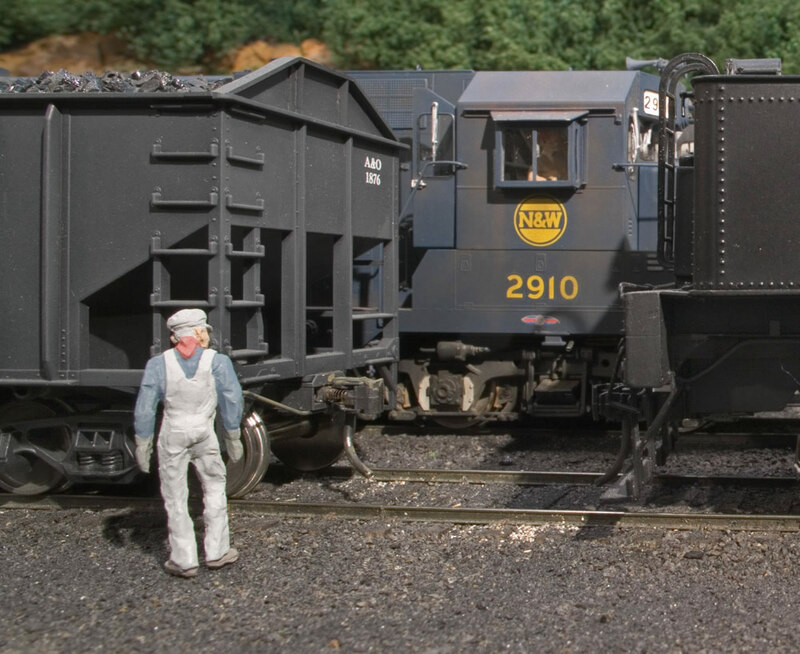 Built from an early article in Model Railroader Craftsman, the Whiting Rotaside Rotary Dump operates flawlessly. Hoppers are held to the rails by a counterweight as the table inverts. Upon completion of finishing the basement, construction began in 1993. Roadbed is the spline method featuring a unique design of 4 strips of Homosote sandwiched between two splines ripped from 2x4’s. The result is a flowing right-of-way that is very sturdy. A minimum radius of 60” was maintained in all but a couple locations and the ruling grade from Willow Creek to Ridge, the designed helper grade, is 2.75%. Most of the track ranges from 48 to 55” inches off the floor. All track and switches are hand laid on ties cut on the table saw. A Golden Spike ceremony was held June 16, 1997. Scenery is roughed in throughout with several areas being complete. Hydrocal subshell and rock castings from my own molds form the mountain areas. The thousands of trees are made from dried weeds preserved with glycerin. The urban area of Millport is just beginning to have its structures scratch built. I use the North Coast DCC system for control. Two 10 amp sections provide adequate power for the numerous operating locomotives. All control panels are recessed to conserve aisle space and may include route control. Communication around the labyrinth that is the A&O is accomplished using old telephone receivers on a party-line system with the dispatcher. A buzzer at each phone location allows the dispatcher to call a waiting road crew A CTC signal system is in process with ABS signals currently operating between Willow Creek to Ridge. One view of the horseshoe curve and the step-in scene on the Big Coal River gorge. North bound loads descend the horseshoe grade above the Shawen branch. Daughter Kari Stewart stands near the "Kari People Tunnel" that leads to the rainy town of Walden Spring. It was Kari's idea to pierce the mountain ridge with an operator passage-way. As with the prototype, the A&O roster of equipment reflects the passage of time. As new equipment is ordered, changes in lettering style, herald modification, and color schemes occurred. This helps create the feel of a real railroad as well as adding visual interest. Lettering was done by decals with some being from homemade silk-screened artwork and others done by computer and an ALPS printer. The following are some examples as found on A&O rails. Set in 1969 the A&O is definitely post steam era. Nevertheless the passage of time is evidenced from the change in paint scheme. Early units are in the traditional A&O deep red and gray. Beginning in 1957 the railroad went to a dark gray body, but maintained vestiges of the earlier red and gray. Then in 1962 to keep pace with changing face of railroading, a modern looking red and gray scheme with stylized lower case lettering appeared, giving the A&O a progressive look. Unless re-shopped and thus repainted, the units on the railroad all reflect their date of manufacturer production and purchase, and the corresponding paint scheme of that era on the A&O. Weaver RS3 in early paint scheme. Model has detailed interior and SoundTraxx. P&D Hobbies F3's in early scheme built by Bob Sobol. Numerous features and all with SoundTraxx. P&D Hobbies F7A in charcoal paint scheme. Numerous features and SoundTraxx. Overland C430 in modern scheme with dual speakers and SoundTraxx. Bob Sobol's 4 truck Shay an ex-West Virginia Pulp & Paper unit has been rebuilt by the A&O historical society and now sees service hauling coal loads up to Willow Creek from Kayford. Oh the joys of O-Scale! The Appalachian and Ohio has phased out its passenger trains by 1969. Nevertheless a lone gas electric, #12 still makes a daily run to provide service for the remote villages deep in the hollers along the A&O right-of-way. Such service reflects the railroads commitment to serve the people of its region. Gas electric #12 is a kit-bash of an All-Nation SW7 and coach/mail car. Five separate, 100 car orders of 40’ box cars are reflected in the A&O fleet. This is evidenced by comparison of the location and size of lettering, heralds and slogans of box cars numbered 3000 through 3400. Box cars are all Intermoutain kits. A number of hopper styles make up the A&O roster with the 3-bay, 70 ton having become the standard. The A&O management prefers hoppers with peaked ends, so 60 3-bays by Weaver with purchased and cast urethane peaks from my own patterns were applied. Train line and cut levers were also added. Then they were lettered and numbered to reflect several order dates. They also sport reweigh dates and locations that correspond to our 1969 era Crew member Jay Barnaby did this work. The Appalachian and Ohio has joined forces with two other free-lanced railroads, the Greenfield Southeastern and the Tennessee Southern to form a refrigerated car cooperative known as the Southeastern Fruit Express. The primary purpose of the SFX is to move citrus and other refrigerated and perishable products from Florida and the south to northern markets. To reflect the passage of time and modernization of equipment, 4 different types of northbound equipment of the SFX are found passing over A&O rails. As with the box cars, there is a progression of the lettering correlating to the time period each type of equipment was purchased and went into service. Lettering was done on the computer and because of the multi-colors, was decal printed at Kinkos. To serve the large International Paper Company complex the A&O management outfitted half a dozen older 3000 series boxcars with roof hatches to carry kaolin. In the tradition of the Haysi Railroad, a branch on the Clinchfield, the Kayford Coal Company has its own headless horseman. A converted F3B unit with a window cut in one end is used to move coal to and from the various tipples on the Kayford Coal Branch. The A&O began as a solo project, but as the years passed several others have come alongside and added invaluable assistance. 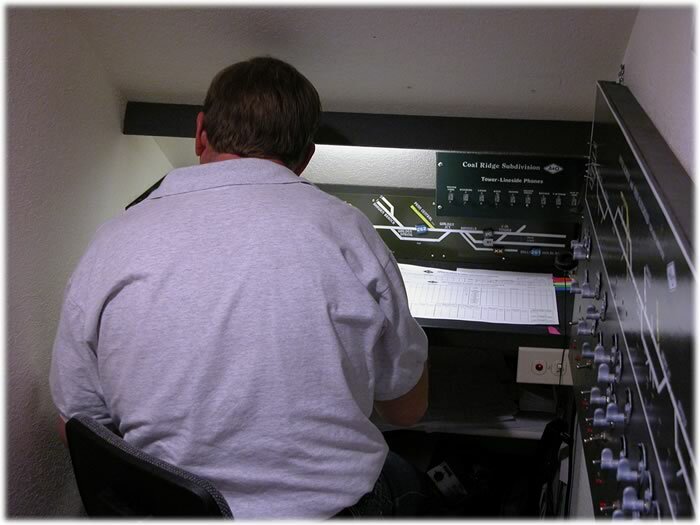 (“If you build it, they will come”) Vince Griesemer has designed and built the electronics for the signal system. Rick Bacon has helped with scenery, equipment and general assistance. Jay Barnaby has spent countless hours detailing and lettering hoppers. And Bob Sobol has handled electronic projects, built exquisite locomotives, been the company photographer, and countless other areas of help. I am greatly indebted to their generosity and assistance.